Main Informations: What is Bhaona ? Bhaona is a dance drama popular in the state of Assam, India. Sankardeva who was scholar and social reformer, was the father of Bhaona. He wrote Onkia Naat for performance in Bhaona. It is seven dramas. It is the product of the Bhakthi movement in North East India. . It has a formal dance structure. It is organised in summer months of year or festival season in Assam. Bhaona is performed not only by men, but also women. And it is not performed in the day time, commonly performed in night. This art emphasising the victory of truth. 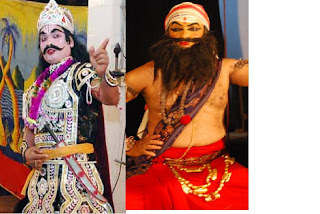 The makeup of Bhaona is very elaborate and the costumes of Bhaona are large. The performers speak dialogues in Bragjabuli language. It is a lyrical form of artificial form of Assamese language.